The Quotas/Bandwidth feature is designed to reduce dynamically the bandwidth of users according quotas rules. With this feature, your are able to define a downloaded flow size per hour/day/week for a set of users. When users reach the limit, the proxy will automatically reduce the bandwidth. This feature is available in 2.27.111311 version or above. Click on Your Proxy on the TOP menu. 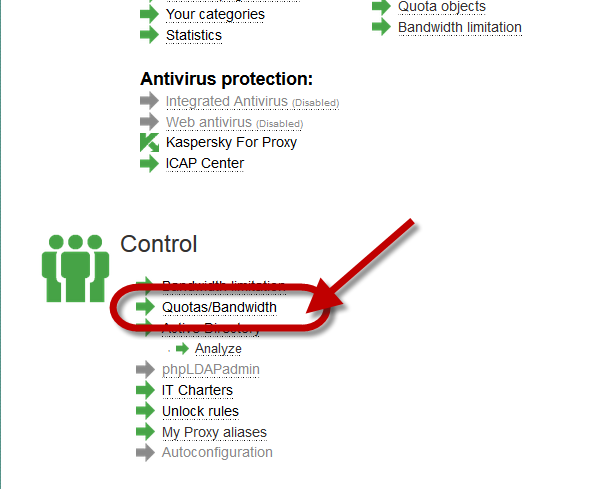 Turn to green the “Quotas/bandwidth” option. Define the schedule to parse quotas in the “Scan each” drop-down list.